We are about half way through December and I don’t know about you guys, but I have not finished all of my holiday shopping! And also, wasn’t it just Halloween?? Luckily most places have expedited shipping these days..so whew! One of my favorite types of gifts to give are small and thoughtful things to friends and family. By small, I mean under $50 but not lacking in style or substance! I’ve rounded up 15 really cool gifts for all different ages and genders, all under $50 (and I own or am gifting about half of these things). My 2018 holiday cards with Basic Invite + a special offer! 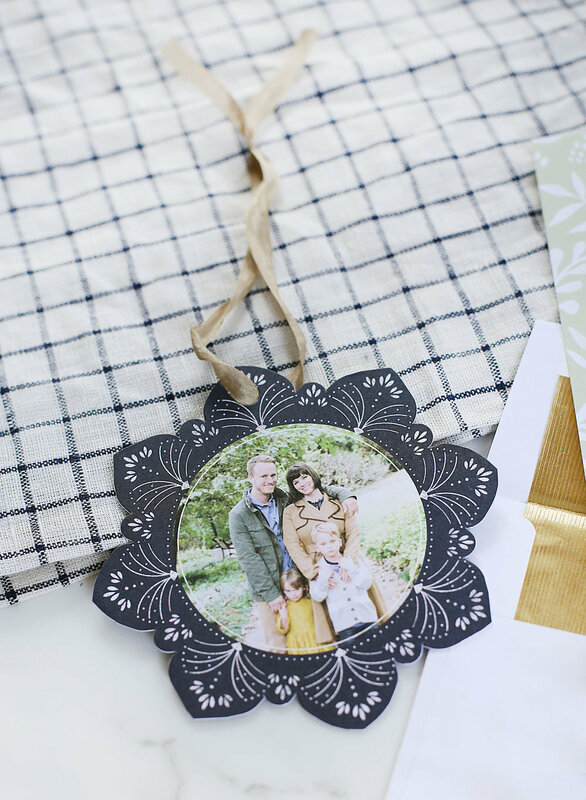 Do you send out holiday cards each year? 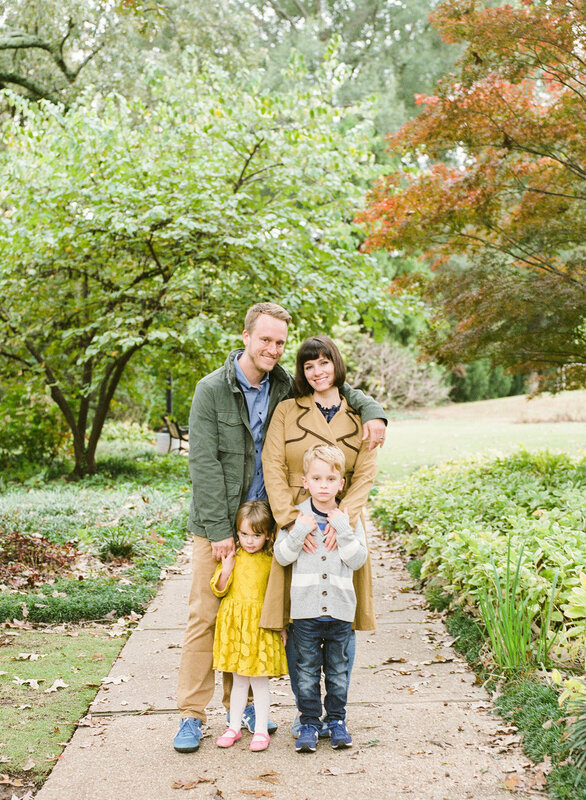 We started doing it after we had kids and have made it a tradition to get our family pictures taken each year for our cards (as so many do). 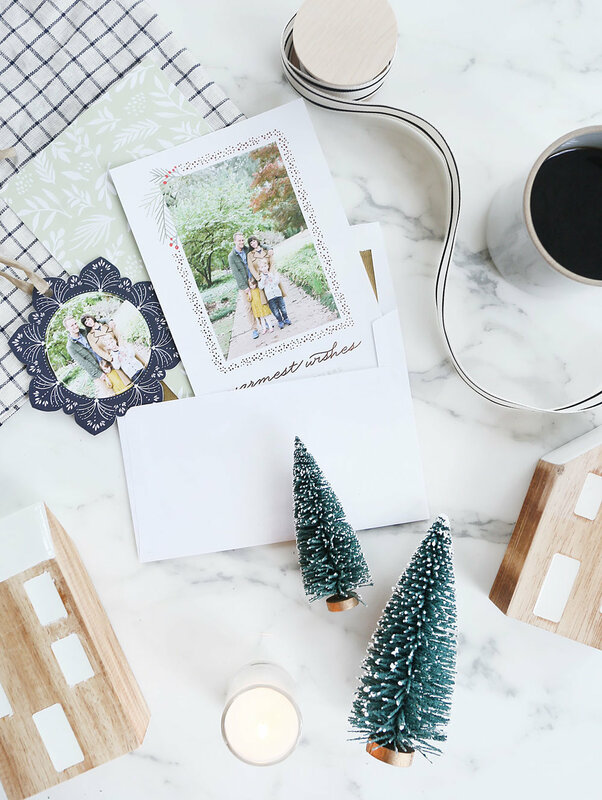 This year, I had the opportunity to test out Basic Invite and was so pleased to discover a new brand putting out beautiful and customizable holiday cards online. They have a ton of lovely design options and I was really pleased with the printing quality and attention to detail. I chose this simple + modern design and added the raised metallic foil which is such a nice touch! You can also customize the color, the font and add the address capturing feature (which I did). I was able to link from my address book and import all my contacts, which saved me a bunch of time when it came to mailing them. They also included that personalized ornament to display on our tree! I really appreciate details like that! There is still time to get them for the holidays! I got super quick shipping and they had really great customer service on a question I had while placing my order. I’m excited to have found a new affordable option for custom cards and stationary! You can use the code holi30 for 30% off their site! And happy holidays from my family to yours! We wish you a Merry EVERYTHING. This post is sponsored by Basic Invite. All thoughts and opinions are my own. Thank you for supporting content that keeps Sunny Circle Studio going! 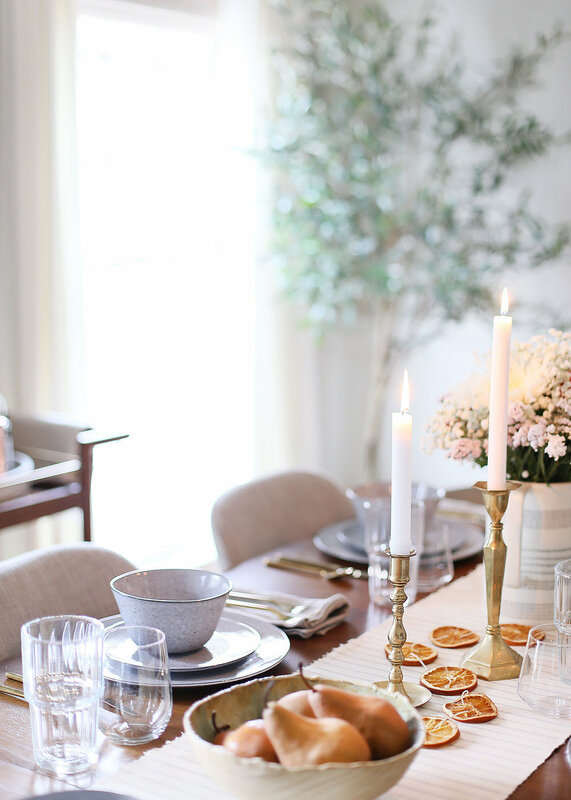 Let’s get into the details of my little Holiday spread! I tried to incorporate vintage & modern elements and mix them with organic objects (like the pears/orange garland/fresh flowers). I’m not quite sure how to describe the style, but it feels very warm and inviting and that feels perfectly seasonal to me! The dinnerware set really sets the tone for the whole scene! It’s the Grace Gray dinnerware set from Unison and I love that artisan hand-made quality of each piece. 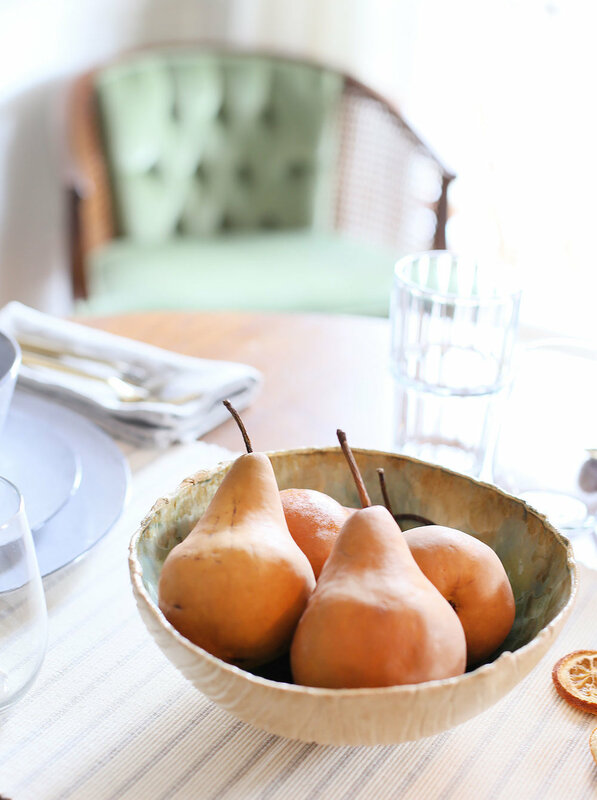 I also got those amazing linen napkins to add subtle texture and warmth to the table. Linen is quickly becoming my go-to for all textiles! 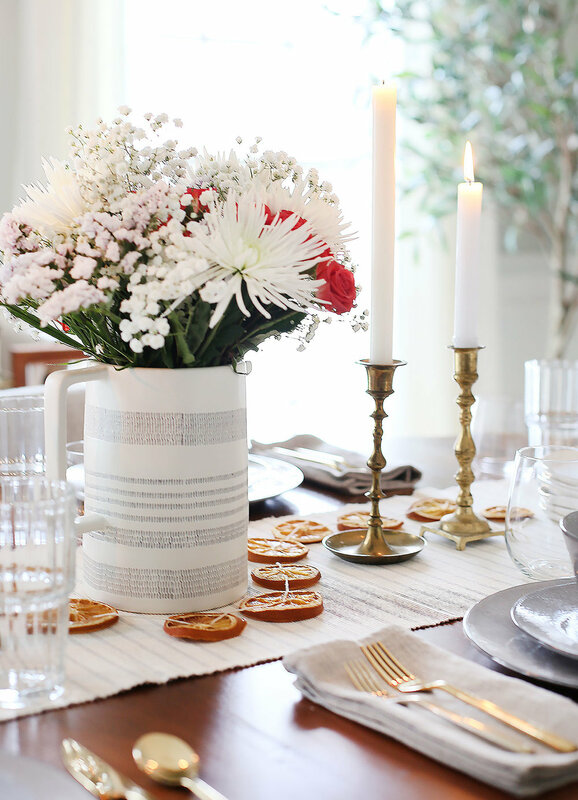 I debated on whether I wanted to use fresh garland or even placemats but settled on that simple striped table runner and I think its the perfect amount of yummy soft texture. I feel like Unison doesn’t get as much attention as other brands, but they are killing it in that oh-so-coveted organic/modern/artisan category! I want all the things! 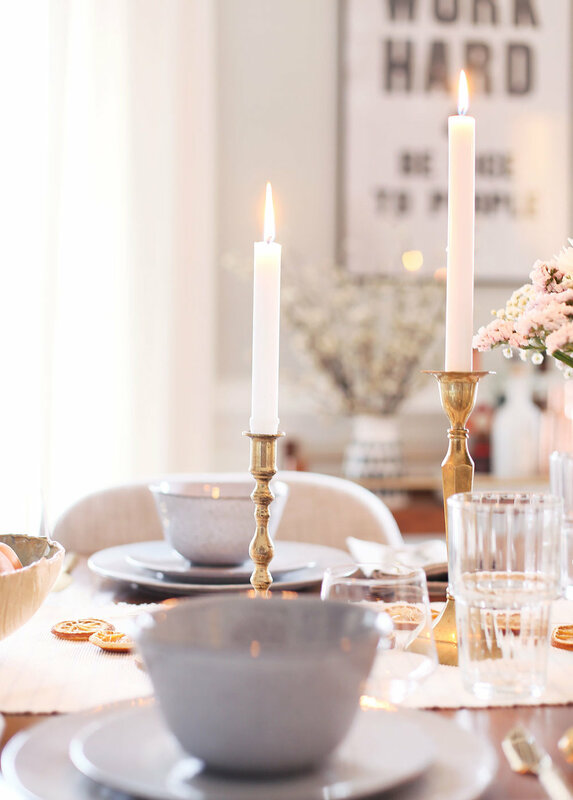 The vintage comes in with those brass candlesticks. I think I paid $5 each at a local flea market! You can’t beat that patina and worn-in feeling! 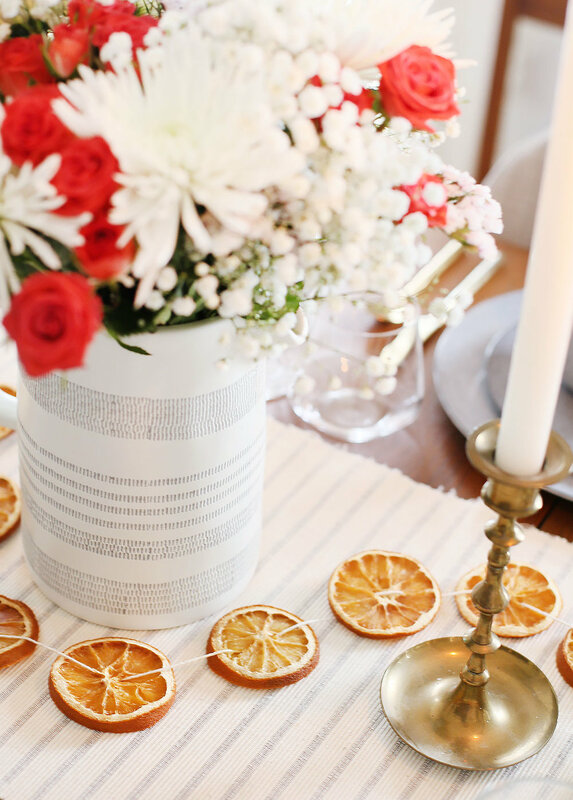 And I took some notes from my oh-so-talented friend Erin and made her DIY orange garland and love the color and organic texture it adds. It’s simple, easy and best of all very affordable (cost of an orange!). Most of the other items on the table are things I already had, like that fantastic pitcher/vase from Target (unfortunately no longer available) and my brass flatware from CB2. The wine glasses are random ones from around my kitchen cabinets and the tumblers are awesome target finds! The pear bowl is something I’ve had for years - a gift from my sister and I still love it to this day. She got it from a local ceramist while she and her husband were traveling. And aren’t pears the best table props? So painterly! And I can’t leave out this amazing new rug from Rifle Paper Co. If I’m being honest, I got a 6x9 and should have purchased an 8x10 but I still love it so much. Especially for the colder months as its so soft and has that moody vibe! Also, keep scrolling for some sources! Hello and happy weekend! Whew! What a week! I’m fairly new to the blogging world and Holiday season is no joke, ya’ll! I = busy (the busiest I’ve ever been)! 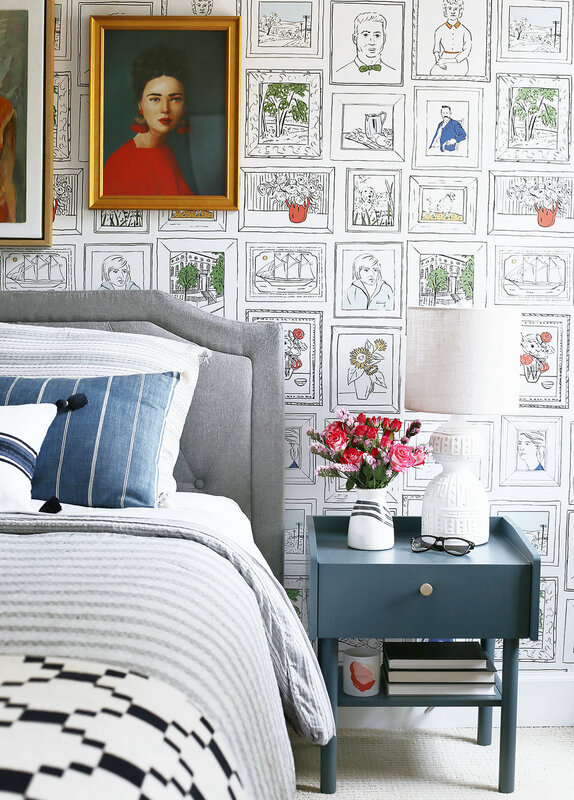 Anyways, I’m happy to share another fun room reveal today – our guest bedroom! 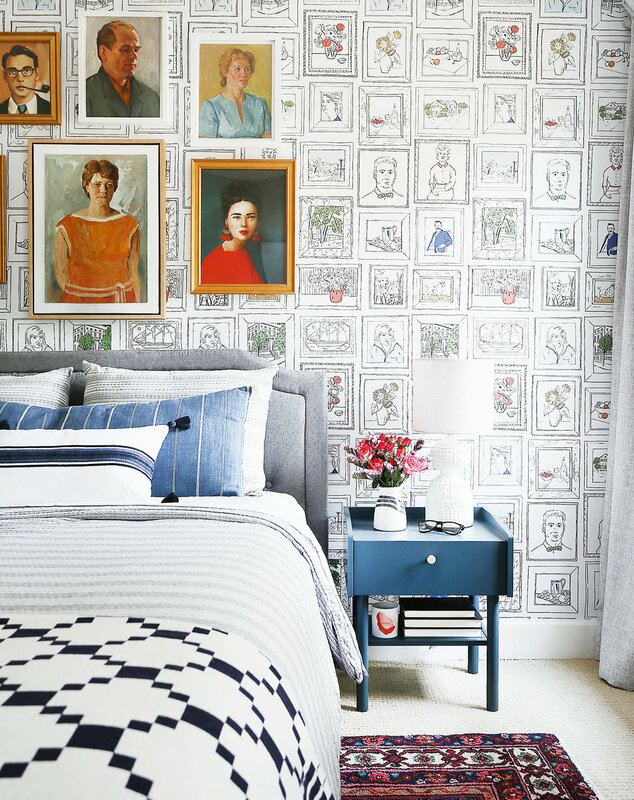 You might remember I gave this room a quick and dirty face-lift earlier in the year, but the room felt a little soul-less to me and needed some personality (or lots of personalities!). 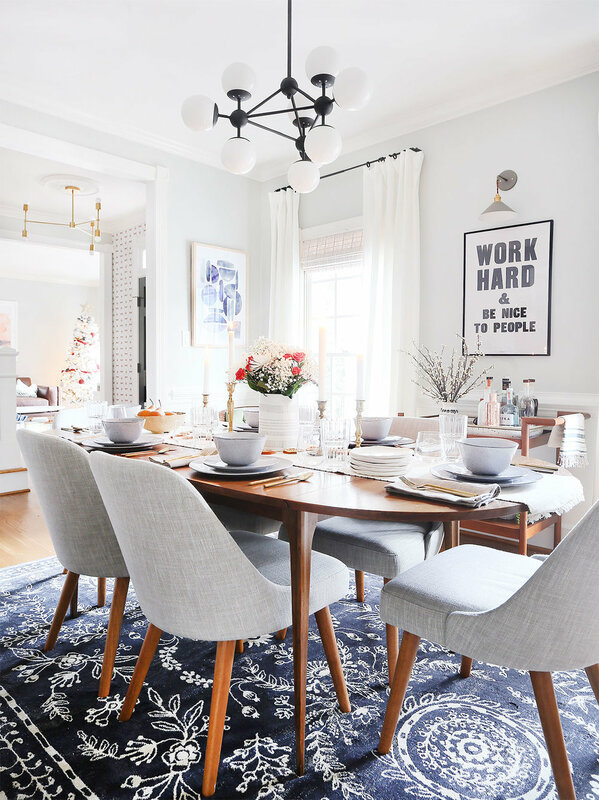 As my styling/designing skills have evolved and changed over the years, I’ve come to realize that (for me) every room needs something vintage and a bit of color/texture. Let’s start things off with that incredibly fun wallpaper from Chasing Paper. I’m a huge fan of their products - the papers are so well made and the designs are equally amazing. And this is not sponsored! This particular style is called Vintage Art and its from their capsule collection with Graduate Hotels. I love the playfulness and the way it really does make this room feel like a boutique hotel, which I am here for! My husband thought it was strange that I was hanging pictures of faces on top of other faces, but I told him to just wait and go with it…and…I kinda love it! 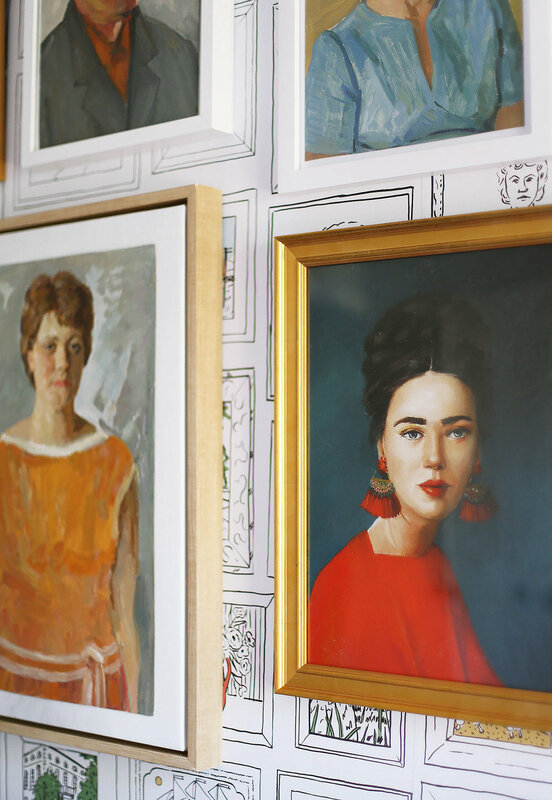 The art is part vintage (from this and this shop) and part vintage-inspired. All of the new pieces are by artist Janet Hill, who has this very thoughtful and nostalgic style that I adore! She has several pieces for sale on Artfully Walls. I also got a new upholstered platform bed from Poly & Bark. I love the modern, low-profile style and the tufting adds a touch of sophistication. We did end up selling all the old things we replaced, including the bed frame, lamps and nightstands so that made this update feel a bit more intentional. Also, let’s talk about the nightstands and the table lamps! The nightstand is a really good one from my old pal, Target. No assembly required and it seems pretty darn well-made for the price! I was also super impressed with the cuteness of those table lamps from Anthro! I love the subtle and unexpected pattern and texture on them. Moving on to the other side of the room is my little reading/scrolling Instagram corner! (ha). I have been eyeing/stalking that Rattan chair from Serena & Lily for years and I finally pounced when they had their Black Friday sale this year. I looooove it and it looks great in all rooms! I may get another one for my own bedroom! And that little zig-zag accent table from Target is awesome! I have used it in several places as well and it works with so many decor styles! I swapped out the light for this simple + modern beauty from School House (which I already had) and kept surfaces pretty simple with books and that amazing candle from Otherland. I’m obsessed with their branding and packaging too and the candle has the freshest scent! Here’s a more pulled back view from the door. 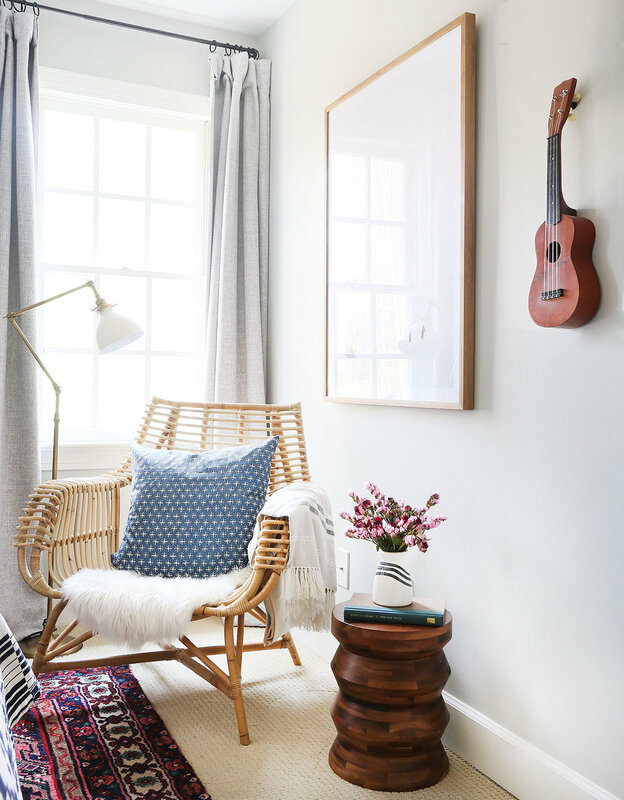 It feels eclectic but still modern and simple at the same time. That’s the goal, anyways! What do you guys think? I’d love to know your thoughts! I’ve rounded up most of the sources below! I thought it was better late than never to share a little gift guide I put together for the menfolk in your lives. I mainly just shopped for my husband (and bought several of these things) but I think most of these items could work for men of all ages. Snag up those good deals while they last! This post contains some affiliate links meaning if you purchase something you've clicked on, I will get a small commission. I only promote the products I truly love! Hello and happy Black Friday! I spent some time researching (shopping) this week and pulled together some things that I want, or have already purchased from brands that I love, all on sale of course. I included a little bit of everything ranging from fashion, beauty/wellness to home decor, naturally. I hope you enjoy!